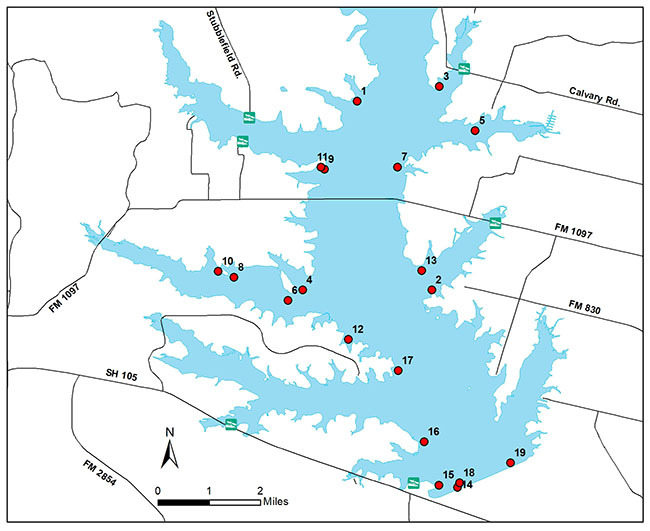 The image below shows coordinates of PVC cube fish attractors deployed by Seven Coves Bass Club (a Friends of Reservoirs Chapter), TPWD, and the River Authority. There are several structures at each marked site. Other partners involved with the project include the US Army Corps of Engineers, Texas Black Bass Unlimited (a Friends of Reservoirs affiliate organization), SprayCo of Houston, and the Bass Anglers Sportsman Society. Coordinates are also available in downloadable files.